Turkey's prime minister condemns the military intervention that toppled Morsi as an enemy of democracy. 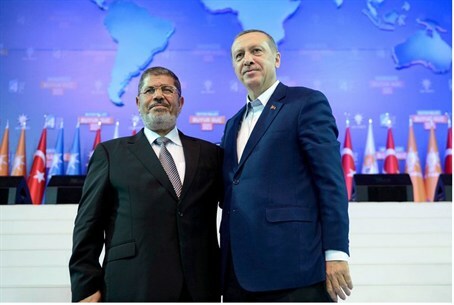 Turkey's prime minister Recep Tayyip Erdogan on Friday condemned the military intervention that toppled Egypt's Islamist president Mohammed Morsi as an enemy of democracy, AFP reported. "No matter where they are... coups are bad," Erdogan said in televised remarks, according to AFP. "Coups are clearly enemies of democracy. Erdogan also lashed out at the West for shying away from calling the military intervention a coup, while welcoming the African Union's decision to suspend Egypt over the army's actions. "The West has failed the sincerity test," said Erdogan. "No offence, but democracy does not accept double standards." World powers have urged Egypt to return to democracy, but the call was offset by a lack of condemnation of the overthrow of the Islamist leader. Referring to coups in Turkey's recent history, Erdogan said his country served as a "very important reference" to Egypt on why military uprisings must not be tolerated. "Each military coup, with no exception, has caused Turkey to lose decades," Erdogan said, according to AFP. "Each military coup has paralyzed Turkish economy. Each military coup has caused the country, nation and young generations to pay heavy prices," he added. Since coming to power in 2002, Erdogan's Islamic-rooted government has sought to curb the powers of the military, throwing hundreds of army officers behind bars for alleged coup plots. On Thursday, in a rare show of unity, both Erdogan’s ruling AK Party and its opposition Republican People's Party condemned Morsi’s overthrow.